At long last, Kehinde moved to England to live the life of her dreams with her husband Albert. Some years later, they had two children, as she secured herself an enviable bank position in London, whereas her husband worked as a mere salesman. Almost twenty years later of life as Londoners, she became pregnant again when her husband finally gave heed to his sisters' insistent advice to return to Nigeria, and establish himself as a big man, since the country's economy was thriving. Considering the fact that Kehinde was the breadwinner of the family, her husband talked her into getting an abortion, as he was absolutely not looking forward to the expenses and drawbacks of a newly born baby. Moreover, his wife was about to get promoted, which made her income essential in the moving back preparation. Albert moved first to Nigeria and then followed the children. He asked his wife to stay back and sell the house before returning. Two years later, Kehinde couldn't sell the house. She missed her family and decided to reunite with them. Upon her return, to her greatest surprise, her loving husband has taken in a second wife. Beautiful, young, educated, pregnant and carrying a toddler. Kehinde felt like an idiot, cheated and defeated. Was it not the same Albert who asked her to get rid of the child they were expecting, now came back to Nigeria and impregnated a woman twice? Once again, Buchi wrote about the many problems affecting us African women and Africans in the diaspora as a whole. How much should we take in the name of culture and tradition? And how much are we willing to sacrifice for the sake of marriage and family? Life was tough for Kehinde; however, I am glad about the last decisions she took concerning her destiny and I strongly believe it was thanks to the guidance of the spirit of her dead twin sister. Though, I felt that she was somehow naive for not realising how selfish her husband was from the beginning; who was only waiting for the opportunity to blow the lid off. As most of my readers already know, I have a strong admiration for Buchi Emecheta. I love her novels and her way of approach to stories. It goes without saying that this was a book I took so much pleasure in reading. Short and absolutely not brief in content. I highly recommend, however, keep in mind that quite few paragraphs were written in pidgin English. Even so, it is no deterrent to enjoy the story. Great review Mary. The husband really screwed her over. I hope she ends up happy in the end. I have only read Joys of Motherhood. This is a great review. You've provided the gist of the story without revealing much. Such books show how far we've come and whether we are making progress. Nana Thanks.... Sometimes, one is always trying so hard just to reveal only the necessary info without being a spoiler. I encourage you to read more of Buchi Emecheta's novels, most of them are really short, insightful and enlightening. Though, like Flora Nwapa, she writes about issues affecting us African women. I love her novels. I enjoyed the review, Mary. It's excellent. Sometimes, love and having too much sympathy can blind us women to the silly foibles and selfishness of our men. Incidentally I just bought Emecheta's Head Above water, her autobiography and Bessie Head's Maru. I intend reading the latter for Kinna's Bessie Head reading event. Hello there, I am also participating in the reading event. I am reading "A Question of Power" by Bessie Head. I look forward to ordering Buchi Emecheta's autobiography any time soon. And I am also looking forward to reading your reviews. Hey, you are spot-on when you say ".....often from her own experiences". In one of her interviews she confirms it... saying she can't be creative.. most of her novels are drawn on her own personal experience. Interesting! And.. yes, please look forward to my next review. It is just a pity stories like this still repeat itself. Such a lovely review. I intend to get a copy of this book. Yes these stories have a habit of repeating themselves. 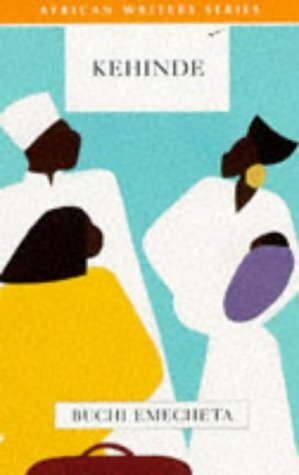 I love Buchi Emecheta's books. Looking forward to reading this one. Yetunde, thank you very much. It is such a pity we cannot learn from history. If you love Buchi Emecheta's book, this is a novel you will definitely enjoy. I would definitely get a copy of this book. Lovely review. I love Buchi Emecheta's books. Excellent write-up, I'm a regular visitor of your blog.